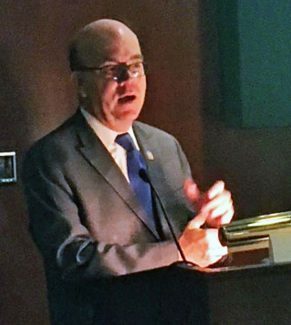 Rep. Jim McGovern, D-Mass., speaks at a Food Policy Action event today. House Agriculture Nutrition Subcommittee ranking member Jim McGovern, D-Mass., told The Hagstrom Report today that he has not not seen a draft of the farm bill that House Agriculture Committee Chairman Michael Conaway, R-Texas, has sent to the Congressional Budget Office for a score, but said if he does not like it he will work to defeat it in hopes of a better bill in 2019 when Democrats may control the House. "We need a farm bill, but I'd rather have no farm bill this year than a lousy farm bill," McGovern said in an interview after he spoke at a Food Policy Action Education Fund briefing in the Capitol. If he does not find the bill acceptable, he said, "I will spend every waking minute to try to kill it and hopefully get a better bill next year." The Republican leadership is expected to need Democratic votes to pass the farm bill this year because conservative Republicans are unlikely to support it. Political analysts have also given Democrats a good chance of recapturing control of the House in the 2018 elections, a view that was enhanced today by the decision of House Appropriations Committee Chairman Rodney Frelinghuysen, D-N.J., not to seek re-election. McGovern pointed out that Conaway has not shown him a draft of the nutrition title even though he is the ranking member on the Nutrition Subcommittee, and joked that he should call Robert Mueller, the special counsel investigating President Donald Trump, to see if he could get it by subpoena. A spokeswoman for Conaway said that conversations about the farm bill titles are "still ongoing." Conaway has received scores on some farm bill titles but not all, and doesn't want to share drafts of the bill "before we know what we can afford," she said. Conaway has said he wants to hold a markup in the first quarter of 2018 but also has said he wants a guarantee of floor time before he schedules a markup. Even though the House Agriculture Committee held 23 hearings on nutrition programs, the new farm bill "has been drafted behind closed doors," McGovern said, adding that he wonders if the Heritage Foundation or House Speaker Paul Ryan, R-Wis., is writing the nutrition title. Farm bills are traditionally bipartisan and "most of these issues should not be partisan," McGovern said. Rep. Frank Lucas, R-Okla., the Agriculture Committee chairman when the last bill was written in 2014, "was a lot more inclusive" than Conaway, he said. McGovern added that he believes if the Democrats take control of the House in November and House Agriculture Committee ranking member, Collin Peterson, D-Minn., becomes chairman, he would be more inclusive than Conaway has been.